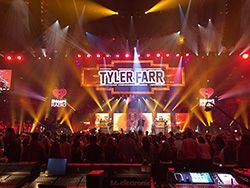 Firehouse Productions JBL VTX system at the iHeartRadio Country Music Festival in Austin,TexasFirehouse Productions recently added 96 JBL VTX V25-II line array elements, 96 JBL VTX V20 line array elements, and 24 Crown I-Tech HD amplifiers to its inventory. Firehouse Productions now has a total of 140 V25-II elements between their New York and Las Vegas offices. Firehouse Productions has long relied on JBL by HARMAN loudspeakers to produce events, like the NBA All-Star Game and the Rock ‘n’ Roll Hall of Fame induction ceremony. The company recently deployed the new JBL VTX system at the iHeartRadio Music Festival in Las Vegas, the BET Hip Hop Awards in Atlanta, and iHeartRadio Country Festival in Austin, Texas. “We started working with a JBL VerTec 4889 rig almost 15 years ago and it became an important foundation of our business,” said Mark Dittmar, lead design & integration engineer at Firehouse Productions.